What's New in BlackBerry Messenger 6.2? Based on your feedback, we've added some new features to BBM! 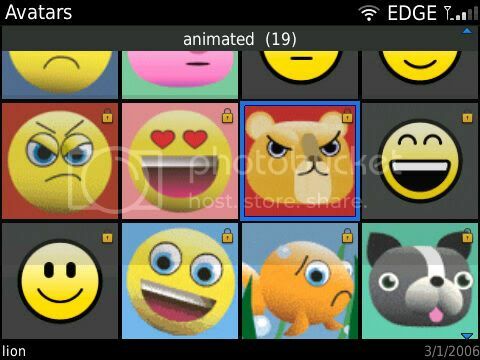 More animated display pictures are now built into BBM. Change your picture to suit your mood. You can quickly change your name or status message without leaving your contact list by clicking the text at the top of the screen. To exit inline editing, just scroll down. You can still access your profile screen by clicking your display picture. When your convenience key set to open BlackBerry Messenger, if you highlight a contact in BBM and press the convenience key, you can start recording a voice note. Once you're done, pressing the convenience key again will send the voice note. Group chats. You can return to the default color at any time. Adding contacts has never been easier. If your BlackBerry smartphone supports NFC technology, you can turn on the Allow Automatic Invitations by Tapping option. Then, as long as you or someone else has BBM open, you can add each other as contacts by aligning the backs of your smartphones. This feature requires that you both have the latest version of BBM installed on smartphones that support NFC technology. When typing the name of a contact or group, the search ignores special characters and emoticons to make it easier to find what you're looking for. If a message didn't send (for example, if your smartphone was outside of a wireless coverage area), you can highlight the message and select Resend from the menu.